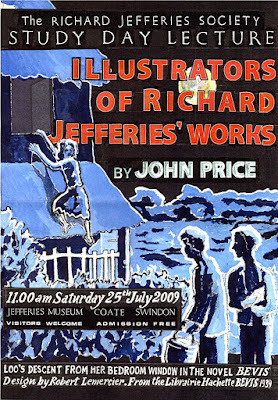 The Richard Jefferies Society will be holding their annual Study Day at the Richard Jefferies Museum, Marlborough Road, Coate on Saturday 25 July between 10.30am to 4.30pm. The topic for the day is the illustrators of Richard Jefferies' works, of which there have been many. John Price, the Chairman of the Society, will give an illustrated talk on the subject in the morning whilst the afternoon session is open to the audience to discuss their favourite illustration or artist. Each contributor will be given 5 minutes. The meeting is open to the public and is free (bring a picnic lunch - refreshments are available). For more information telephone 01793 783040.